I am the Other Cat. The Other Woman. I met Elvis at Cat House and he took me home. Based on a true story. In part 1 - Mod Squad of cats ‘n dogs – day in the life of Surf Dog Diaries by Kihei the cat. In Part 2 – In the Beginning – the day Kihei the tabby was adopted. I am the Other Cat, the Other Woman. It’s about time you heard the other side of the surf dog story. Here in the Columbia River Gorge, we live wild - cats and dogs, cougars and wolves, people and surfers. I am an indoor kitty now. Large and round and soft and fuzzy, cozy and confident. Brightly colored, I stood out too much in the wild. Now, living inside, I’m no longer hiding and hungry. I am the brains of - the cat in charge of - the Surf Dog Diaries. Oh, but my bff - my Elvis! Big and strong. Confident and steady. A little slow – after all, he is a basset hound. No hurries – no worries. Eccentric about his bed - circling and circling, to get his body into position…. scratching and scratching, until it feels… just … right… before plopping down with a shuddering sigh. Then, snuggling up to me. Cat nap time! I’ll never forget the moment we met. The door creaked open at the home for wayward souls. Elvis dragged himself slowly up the steps, and nosed right in. A dog walks into a house full of 25 kitties. Like he was looking for something – some one – at Cat House. Like it was no big deal that a dog drops by a house full of cats, to take a look around. His person, the woman with long golden retriever hair, brought him in to pick from a house full of rescue kitties. To take one kitty home. Those big, brown, basset eyes, outlined in black! Droopy eyes. Knowing eyes. Eyes, sweet and soft. Subtly confident. Not braggy. Open to the possibilities. Smiling eyes. We didn’t have a lot of smiling eyes at Cat House. He had two inch legs. Funny what you notice. That head was massive and so were his feet. A basset hound wading into a sea full of cats that could easily pounce him. Cats, big and small, wild and scaredy. Cats who lived in curtains and blankets and boxes, couches and baths. That was us - that was me. But it was weird that day. Like, all of a sudden, there was a new Us. We wore the same colors– red, brown, black and white. We looked related –twins, if that’s even possible. A calico and a basset. Elvis and me. Elvis was a windsurfing basset hound. Alpha of our surf dog family. No self respecting cat would be caught on, or in, the water. But – whatever! My twin was a dog. Elvis was 70 pounds of solid muscle, bearing down on two inch legs. Which I found out later, makes him an amazing athlete. Low and solid. Good balance. And we’re not talking about easy surf dog days, on flat water that doesn’t move around. He rode the mighty Columbia River. We’re in Hood River, Oregon - the Windsurfing Capital of the World! Where the wind whips up from Mount Hood to the cliffs all around and the river moves so fast. And the waves – yes the waves- right here on the river - crank up, high, overhead. I ran from them when I was a wild kitty. Elvis had a big heart. He loved all animals, all people. All sunlight and rain and glowy sunsets over the Columbia Gorge with orange highlights along the craggy cliffs towering up above as he surfed by. His little basset brother was blind and Elvis watched out for him, on the surfboard and the rest of life. Elvis also adopted the little doxie - because he was young and Elvis was old. He wanted someone to carry on the surf dog family tradition. Elvis loved all sports. July 4 and Christmas parades - streets lined with hundreds of kids, waving and laughing, as the surf dog float rolled by. Parades are a sport, right? Elvis surfed on a board behind a ski boat, wearing a colorful vest. Big ‘ol basset hound ears normally dragging on the ground - flapping, happy. Flying circles in the breeze. He rode waves on the ocean, at Dog Beach. Elvis loved windsurfing with our person, and his little brothers, the blind dude named Dude and the wiener dog, Doodle. What a weird pack - three dogs, all low, and the woman - all on one board! Here, in the wild, where kite surfers and windsurfers and paddlers and salmon share water, and waves. Elvis was a rock star. Maybe that’s what rock stars do… open us up and show us something we couldn’t figure out on our own. Like writers do. Writer dogs. I’m a writer cat. I’m working on our life story here. I heard that Elvis wasn’t Alpha when they lived in California. Must be all those fancy people and animals down there in the big city. We’re more down to Earth here in the country. He must have grown into his Elvis-ness after moving to Oregon. I miss his old soul here on Earth down below. Only the doxie remains in our house, now that my Elvis has left the building. From the wild to Cat House. From Cat House to the home of surf dogs. At Cat House, all 25 of us kitties lived in a full sized house – people sized - in a normal neighborhood, with normal people. Houses next door and kids and cars and yards and dogs and skateboards. Talk about catty! Can you imagine a house full of felines, hanging out all day, inside? The things we might think or do? The first person I met at Cat House was the one that found me hiding in the forest. Coyotes were circling around - it wasn’t a good scene. I was too bright and colorful (translation: awesomely beautiful) to live in the wild. It was hard to hide. But it was amazing, living like our ancestors. Hunting for quail and moles and rabbits, and living under cliffs that light up with warm sunlight every morning, making you feel small and kitten-like, down below. The cat lady trapped me and brought me here to Cat House, and for while I was still wild and flighty. She fed us, and paid our bills, but no human lived at Cat House. It was already full – four or five cats per room, depending on who got along and who staked out what furniture. Which, as you can imagine, was shredded. 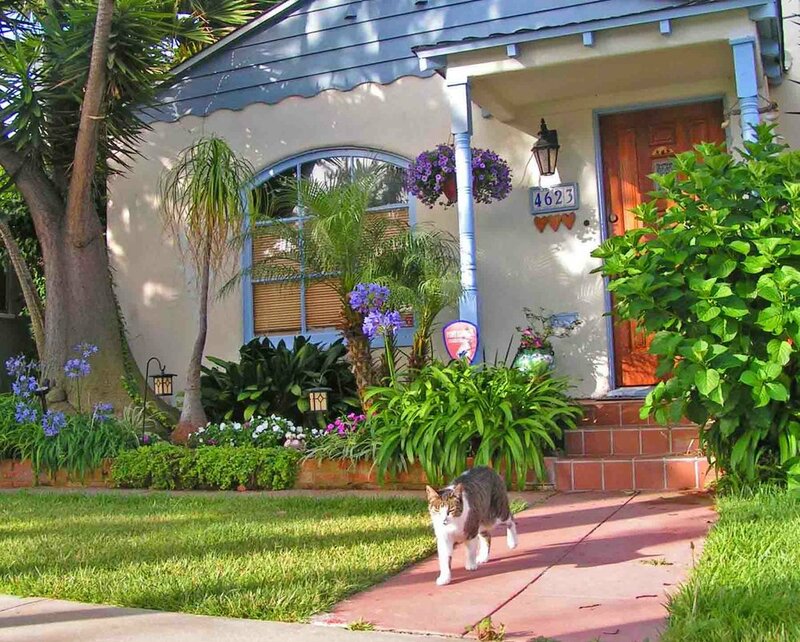 The woman ran Cat House in her spare time when she wasn’t making house payments for homeless cats, so they could live in a real neighborhood, with real neighbors and try to assume a so-called real life. While we all waited around for a house of our very own. Don’t all cats have human servants to buy their homes and pay their bills? He was handsome. And bold. Fearless. What self-respecting dog walks into a house of 25 cats – willingly? He did. He didn’t turn and run away. Normal dogs would. I heard about the first cat that Elvis lived with – Kihei, back at Dog Beach in San Diego. It took that cat 13 seconds to pick out her new family from the lineup at her California Cat House. It took Elvis about the same amount of time, here at Cat House Oregon. He walked in. Our eyes met. The house of 25 cats shrank to one. Everyone else disappeared. He seemed like a sweetheart of a guy. I picked him and he picked me. I am Tia, which is Spanish for Auntie. But I was not destined to be Elvis’ Aunt. I was destined to become his sister – his Hermana. But whatever. It’s just a name. Anyway, in about 13 seconds, the deal was done. There was no fighting like cats and dogs. That’s just some crazy human notion. People are so competitive! Like you have to choose if you’re a Cat Person or a Dog Person! For the record, I’m both. Did I mention that I’m beautiful? Fat, as if there’s anything wrong with that. And so, Elvis took me home. The rest is surf dog history. Cat takes over the dog blog. And house. At Dog Beach! Based on a true story. By the cat, Part 2. Dear Dog Diary - In the Beginning - 1991… I remember the day She first picked me up. It was in the Cattery at the jail with all those other kitties. Actually, it wasn’t bad, it was San Diego Humane Society – but it was still jail. That place in between. For homeless kitties.